Zap! Pow! Wham! DC COMICS freebies at breakfast time! I've mentioned this WEETABIX promotion before in a previous post but now I've (finally) found an advert (published in LOOK-IN cover-dated 10 November 1979) to prove it really did happen! During the promotion, buyers of the (frankly unappetising) breakfast biscuits could collect the free cards within each box (the bigger the box, the more cards included). Frustratingly, the advert doesn't show them. 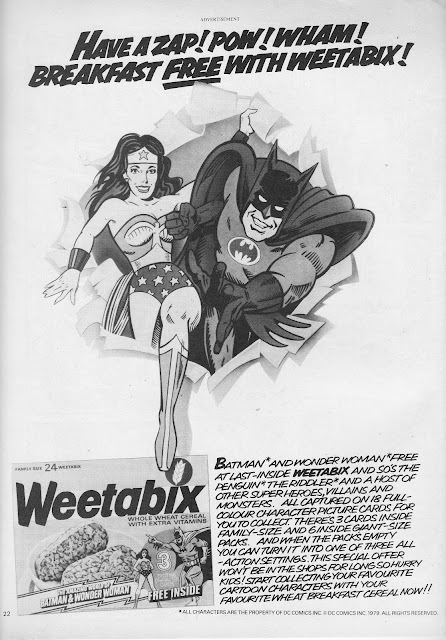 Similar tie-ins also ran for FLASH GORDON and STAR TREK: THE MOTION PICTURE (Weetabix really was the breakfast cereal of choice for would-be geeks). The copy also mentions that the boxes doubles as action scenes for the cards (the base of the cards allowed you to stand them up, providing there was no hint of a breeze). I don't recall these but i do remember boxes having a DC superhero mask printed on the reverse (I chose the Flash after careful consideration in the local Tesco) which suggests that the DC tie-in continued longer.